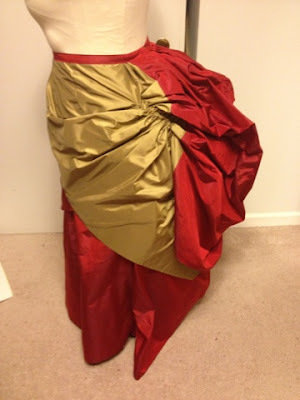 Costuming Drama: Wednesday update: Apron Done! YAY! That took comfortably as long as I thought it would, which is great because I am getting better at estimating how long things take me. Excellent. The apron is done and with the exception of putting the buttons on the stomacher, which I am avoiding like the plague for some reason, I am a trim-making fool for the next week, which seems reasonable. 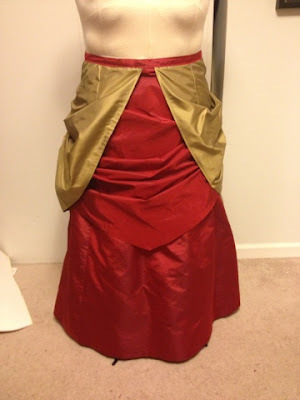 The apron and the skirt are cut from the very same fabric, right next to one another, but because one is cut cross grain and one is cut straight grain, they look like 2 different colors of red in some light. Here's hoping that trim helps that out a lot! I realized my day counter was off because I was counting the day that I was posting, which is typically over by the time I post. so that's fixed. All-in-all I feel like I am in pretty good shape for being a week out.